Most dads I know are race fans. 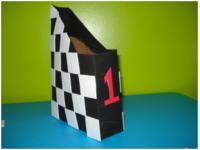 Nascar, Formula 1, motocross... if it ends with a checkered flag, chances are they enjoy it! 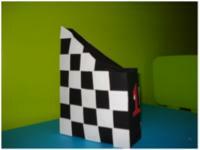 Since checkered flags are perfect for practicing patterns, we thought of a useful Father's Day gift for our favourite racing fan. 1. Gather your materials. 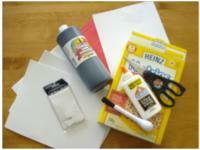 You will need white fun foam, black poster paint, a paintbrush, a cereal box, white glue (or hot glue), scissors, red cardboard (we used an old duo-tang), a pen, a ruler, and scrapbooking dimension squares. 2. 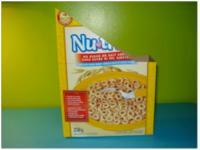 Cut the cereal box to give it the shape of a magazine holder. 3. 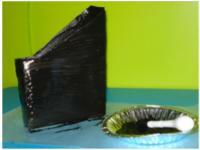 Cover the cereal box with a thick coat of black poster paint. 4. 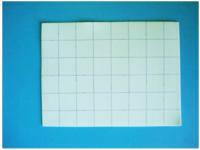 Measure 1 ½ inch squares. 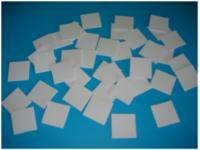 You will need approximately 30 squares, depending on the size of your cereal box. 5. Cut out the squares. Encourage older children to count 30 squares. Younger children can make three piles containing 10 squares each. 6. 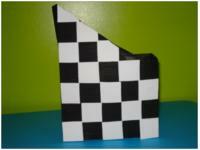 Show children how to create a checkered flag pattern. Glue the squares in place, starting at the bottom. 7. When you reach the top, help children cut the edges of the last squares. Repeat on the opposite side. 8. Cut number "1" shapes out of the red cardboard. 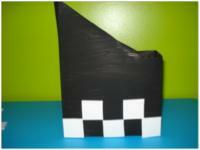 Use the dimension squares to glue them on either end of the magazine holder and you're done!